Do you ever look back at old photos and wonder what makeup you were wearing? A few weeks ago I was doing just that and trying to remember how I got such a glowy complexion without the use of a highlighter. I love love love glowing skin! It looks healthy, bright and more natural than a matte finish. I finally realised that I had a glowing complexion in past photos because I had started using the E.L.F Makeup Mist & Set on a daily basis. It contains Aloe, Green Tea and lots of vitamins which helped to get rid of any powderiness and make my face glow. Recently E.L.F UK closed down and so I was looking for a replacement, after trying the whole rosewater mixed with water and just not getting the same effect. 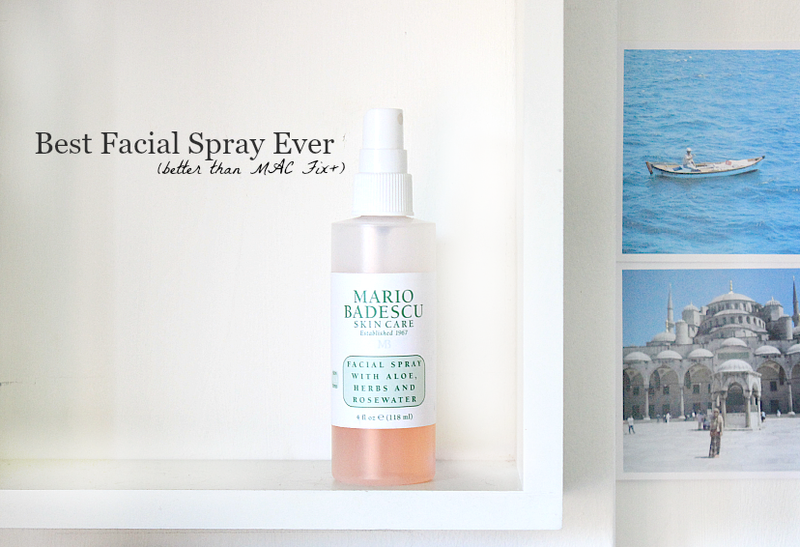 After doing a bit of reading online I discovered the Mario Badescu Facial Spray and there were simply rave reviews after rave reviews about the stuff. And well....not to ruin the surprise or anything but this is going to be another one! Those who have been reading my blog know that I am an ethical beauty buyer which means I’m boycotting MAC Cosmetics to name a few. I plan to update my page on that at some point so it’s less intense and more clear as to why exactly I am doing this, but anyways one of the products I did own before I started boycotting was the MAC Fix+. To be honest with you I preferred the E.L.F spray over the MAC one anyways (I still have half of the Fix+ left) and I’m happy to report that the M.B version is even better than the two of them! In the simple plastic spray bottle, contains a facial spray which also contains Aloe as well as herbs and rosewater. It is paraben free, a light peachy/pink colour and has a shelf life of 24 months. Firstly it’s an ethical brand so no profits will fund oppression of innocent people! Secondly it’s cheaper and much better value for money. This 118ml bottle only cost £7.50 (yed the price has increased, which is a shame, but it is popular for a good reason, I can't blame them). Even though I use it on a daily basis and I’ve gotten through it faster than any other facial spray in my life, it’s so affordable I’m happy to repurchase it. Plus it’s easily available from beautybay, who deliver fast and it's free when you spend over a tenner. Thirdly the ingredients are actually good for your skin, rosewater helps maintain the skins PH balance (hence why this is a great toner), it hydrates, moisturises and calms the skin and the scent it beautiful - like an actual flower rather than that artificial rosy scent. Aloe is fantastic for all skintypes as it’s super soothing and cooling and the herbal scent is wonderfully calming. Also this spray doesn’t contain glycerine which the MAC Fix+ does and apparently that makes oily skins oilier - so don’t think this spray is only good for those with dry and dehydrated skin! Pros: Has so many uses, adds hydration, removes powderiness, makes matte foundations dewy, ADDS SO MUCH GLOW!! !, Smells lovely, is calming and cooling, affordable, does everything MAC Fix+ does but with added skincare goodness, no parabens, nourishing ingredients, great for all skintypes, increases pigmentation of eyeshadows. Cons: I think if you HATE any smell of rose you might not love this...but it’s such a beautiful herbal smell and calming too. The nozzle of the spray isn’t quite as spritzy/fine as that of the Fix+ so I hold it a little further back but it’s not hard to use by any means. Repurchase: YES! I am obsessed with how much this ‘finishes’ my makeup, giving it an effortless looking glow and makes my skin feel happy. I will repurchase this over and over again - highly recommend this ladies! A HG for sure!